We often overlook the root cause of dry dandruff: Malassezia Furfur bacteria naturally found on our skin and scalp. When the scalp lacks balance, hydration, or the proper amounts of oil to combat the bacteria, we see an overproduction. This all leads to the scalp condition we call dry dandruff. This type of dandruff is most often characterized by the appearance of white flakes that may be seen on the scalp, hair, or clothing. Other symptoms of dry dandruff include scalp tenderness, redness, and itch. The irritation and dryness affecting the scalp often leads to itching of the scalp. Scratching your scalp may provide temporary relief, but it can create hair breakage and even hair loss if left untreated. Like dry dandruff, the oily type of dandruff is caused by the overproduction of the bacteria Malassezia Furfur. Unlike the dry form, you may not even realize you have oily dandruff because the flakes are not easily visible to the human eye. The overproduction of oil or sebum occurring in the scalp and hair hides the flakes, holding them onto the hair or scalp. Our certified Trichologists use specialized scalp cameras to view the scalp under different magnifications to detect oily dandruff on scalp and hair. 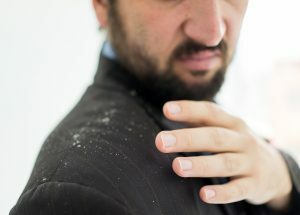 Symptoms of oily dandruff can include itchy scalp, oily hair, and yellow, waxy-looking flakes that stick to the scalp, hair or nails after itching. Oily dandruff itself is a scalp and hair condition, but it is also a sign of an underlying problem, oily scalp and hair, which can contribute to hair loss and thinning if not addressed. A multi-therapy approach is the ideal way to PREVENT and/or CORRECT your type of dandruff. It is key to treat both the bacteria as well as any scalp imbalances, such as a dehydrated scalp or an excessive production of oil. A certified Trichologist will create a custom Scalp Treatment Protocol designed with a carefully formulated blend of anti-bacterial essential oils to treat Malassezia Furfur bacteria while powerful plant stem cells rich in antioxidants and amino acids rebalance the scalp. Are you ready to find relief from your dandruff? Discover the Health of Your Hair and Scalp.